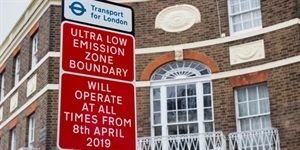 London's long-heralded Ultra Low Emission Zone will begin operating on 8 April. All vehicles operating on roads in the current Congestion Charge Zone will have to meet new, tighter emissions standards or pay a further daily charge to travel within the area. Several other UK cities - including Birmingham, Manchester and Leeds - have announced plans to introduce Clean Air Zones; with similar aims to London's ULEZ. In London, all vehicles, including cars and vans, will need to meet the tailpipe emissions standards or pay an additional (£12) daily charge to drive in the ULEZ area, which initially matches the Congestion Charge zone but which will be extended to inner London areas in 2021. London is the first to introduce these standards universally, but across the UK many areas are being encouraged to follow suit in response to the public and UK Government’s push to improve air quality in the worst affected (mostly city-centre) areas. The pressure to introduce Clean Air Zones is a result of the UK's failure to meet internationally agreed air pollution standards, highlighted by the NGO Client Earth in high profile court cases. The London ULEZ is the forerunner for the introduction of Clean Air Zones (CAZ) to be introduced in several other cities (Birmingham, Leeds, Glasgow) around the UK (known as Low Emission Zones – LEZ – in Scotland). Other authorities are sure to be watching the London experience closely. So far, only London and Birmingham have announced plans for CAZ ‘D’ low emission zones that will include standards for cars. Leeds has announced a charging zone to include HGVs (type ‘B’ in government language; type ‘A’ is for buses, coaches, taxis and private hire vehicles while type ‘D’ can cover nearly all road vehicles). Of the other ‘first wave’ authorities, Manchester is initially proposing a type ‘B’ CAZ from 2021 (extending to type ‘C’ – including vans and minibuses from 2023) while Nottingham plans to meet air quality targets without the introduction of a charging CAZ. A further 23 ‘second wave’ local authorities have been directed by the Government’s Joint Air Quality Unity (JAQU) to develop local plans to ensure air quality compliance, while 33 more authorities are under notice to ensure they comply over the next three years. Fleets and vehicle operators are likely to be challenged by the different language used to describe local air quality measures and the differing measures in place across the country. A key point for fleets is that the Government (advised by LowCVP and other bodies) is ensuring that there’s a consistent national framework for these emission zones (including the ULEZ, CAZ and LEZ) so that operators know that compliance with rules in one local authority area are consistent with those in another. Operating Euro 6 or VI diesel or Euro 4 petrol vehicles, means compliance (charge exemption). New vehicles operating on any fuel type bought today also meet the requirements of all the planned air quality emissions zones.